In 1948, the Olympic Winter Games were resurrected following a 12–year gap. The bloody global conflict that was World War II had caused the cancellation of the Games in 1940 and 1944. The 1948 Winter Olympics, officially known as the V Olympic Winter Games, were heralded as an emblem of new world peace and good will. They were given the name "The Games of Renewal". The International Olympic Committee Executive Board meeting on Sept 4, 1946 decided to hold the first post–war 1948 Games in the famed resort town of St. Moritz, Switzerland, located in the Swiss Alps, on the slopes of the highest (6,000 feet) major valley in Europe. The country hadn't suffered physical scars from the war because it had been neutral during the conflict and since most of the venues were already constructed for the 1928 Games, St. Moritz was a logical choice to become the first city to host a Winter Olympics twice. This also made the organization of the Games simpler and more economical. Despite the existence of many of the venues, it was still a difficult task for the Swiss to organize a Winter Olympic Games in less than 18 months. 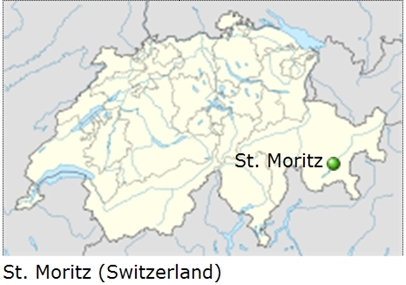 So at short notice St. Moritz took up the torch and became the first venue to host the world for a second time. Still, the war's impact on the event was undeniable. The Axis powers of Germany and Japan weren't permitted to participate because they were still ostracized by the international community for their role in World War II. Stalinist Russia declined to take part (but they did send ten delegates as observers of the Games to determine how successful the Soviet athletes would have been had they competed). The Games, however, felt the effects of the war as countries were unable to properly equip their teams, forcing athletes to improvise with many Olympic competitors having to use substandard equipment. A shortage of money and the imposition of travel restrictions resulted in a lack of spectators. The ranks of the once dominant Norwegian Nordic ski team had been depleted by the war, while the Swedes, who had remained neutral during the war, eventually swept the medals in Nordic events.